No longer will you be able to play online matches of Fortnite or Splatoon 2 without paying for the Nintendo Switch Online service. Announced today as launching in less than a week, the Nintendo Switch Online service is a step forward in Nintendo’s customer experience. Sure, it may seem like a bit of a hassle to have to pay to casually race around Mario Kart 8 Deluxe online, but the benefits of paying for the Nintendo Switch Online service far outweigh the cons. The Nintendo Switch Online service will launch with online multiplayer modes for over 20 NES games, including Balloon Fight, The Legend of Zelda and Super Mario Bros.. Also, for the first time in Nintendo history, you will be able to back up your save files to the cloud for certain games. 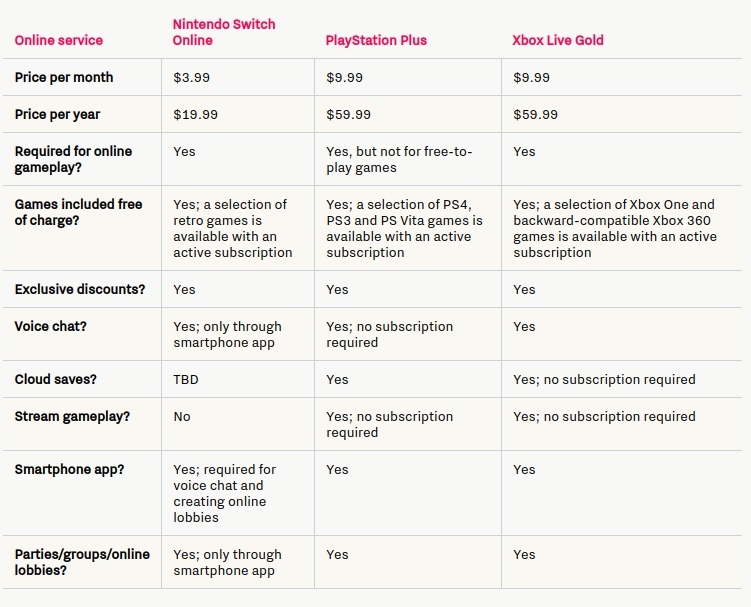 The pricing is very reasonable for the Nintendo Switch Online service, as laid out in this simple chart by Polygon. Whether per month or per year, the price to play Switch games online is always a lot cheaper than PlayStation Plus or Xbox Live Gold memberships. Sure, you get a lot less for the Nintendo Switch Online service, but maybe that’s what the gaming market needs: a more simple and cost-effective online multiplayer service without all of the bells and whistles. For way too long, Nintendo did not have a release date set for the start of the Nintendo Switch Online service. While its launch date may have been announced at last week’s Nintendo Direct should it not have been delayed due to a devastating earthquake, it’s likely the service will be outlined more specifically in tomorrow’s Nintendo Direct at 6pm EST. Players will be able to try a free one week trial to feel out how the Nintendo Switch Online service works.